Most independent filmmakers produce a film, get it out to the public as far as quickly possible, and then move on to the next project. When Betty and I started this experience of making BRAVO!, we had little idea about how films are made and in some ways we have continued to operate outside the normal purview. One of the things we have done differently than a lot of independent filmmakers is to keep pursuing the distribution of BRAVO! even though we finished the film a number of years back. Our feelings and thoughts on the subject are that if there is somewhere we can manage to get BRAVO! on a screen and inculcate a discussion about war and combat and the aftereffects of these activities, then we will do our best to make that happen. Our friend, Marine and former prison warden, Terry Hubert, earlier in the life of BRAVO! suggested to Betty and me that we were educators and we have taken that suggestion to heart. And as we approach the 50th anniversary of the Siege of Khe Sanh, there is flurry of activity coming up in BRAVO!’s screening arena which we think will offer more opportunities for us to share history, art and education. 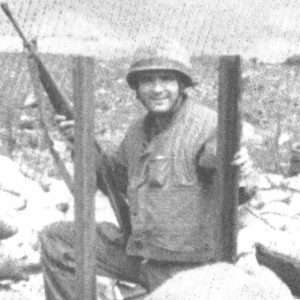 Ken Pipes, Skipper of Bravo Company, 1/26 at the Siege of Khe Sanh. Later in the month we will travel to Fallbrook, California to meet with BRAVO! Marine Skipper Ken Pipes where we will then screen the film at Camp Pendleton on September 13. The screening will be part of H & S Battalion, 1st Marine Division’s PME program. Skipper Pipes and I will be joined by several other survivors of the Siege in this presentation that will begin at 1300 and end at 1400. Location for this event will be specified soon. On September 21st, 2017, BRAVO! will be broadcast on Idaho Public Television immediately following Ken Burns’ documentary, The Vietnam War. The broadcast will begin at 9:30 MDT (and PDT in IPTV’s Pacific Time Zone locations). PBS will also show the film on its PLUS channel at 7:00 PM MDT (7:00 PM PDT), September 24, 2017. In conjunction with the PBS showings of the film, Idaho Public Television will also rebroadcast Marcia Franklin’s DIALOGUE segments of her interviews with us—Ken and Betty Rodgers—and BRAVO!’s Steve Wiese. The two segments will run back-to-back starting at 10:00 PM MDT (10:00 PM PDT) on September 26, 2017. You can take a look at Idaho Public Television’s schedule, plus a lot of other informative info, here. Also in conjunction with the Ken Burns documentary, the Nampa Public Library in Nampa, Idaho, will screen BRAVO! on November 1, 2017. Doors open at 6:30 PM and the program will begin at 7:00 PM. A panel discussion with Vietnam Veterans is scheduled to follow. The Nampa library’s website is http://nampalibrary.org. On November 17 and 18th, BRAVO! will be screened in Santa Fe, New Mexico, twice on the 17th (once in the afternoon and once in the evening) and on the evening of the 18th at the New Mexico National Guard Bataan Memorial Museum. Details are forthcoming. You can access information about the New Mexico National Guard’s Bataan Memorial Museum here. On April 7, 2018, the Warhawk Air Museum in Nampa, Idaho, will host a one-day symposium in recognition of the 50th Anniversary of the Siege. 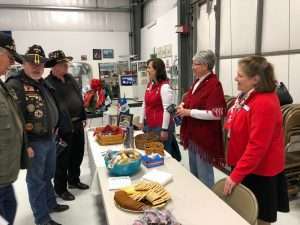 The event will encompass several goals: a forum for educating the public about the Siege of Khe Sanh and the Vietnam War, as well as an opportunity for a Khe Sanh Veterans Reunion. Activities will include a screening of BRAVO! and guest speakers remembering the battle. Khe Sanh Vet Mike Archer, author of two heralded non-fiction books on his Khe Sanh experiences, will be one of the featured speakers. You can see more about Mike at http://www.michaelarcher.net. Mark your calendars now, as this will be a stellar event in a world-class air museum. This last event is still in the planning stage, so if you would like to participate and were involved with the siege, or just want to help, please, please contact me at 208-340-8889. An event like this can only happen with a core group of committed volunteers. We can’t do it without you! 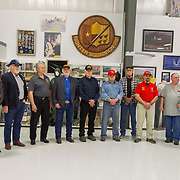 For more information on the Warhawk Air Museum, check out their website at https://warhawkairmuseum.org. 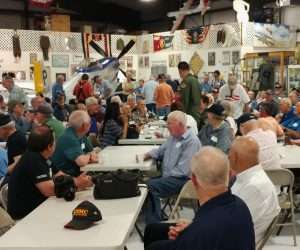 Last week I had the privilege of speaking before 150 folks at Nampa, Idaho’s Warhawk Air Museum. I talked about the making of BRAVO! 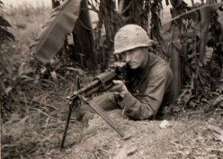 and my experience at the Siege of Khe Sanh. 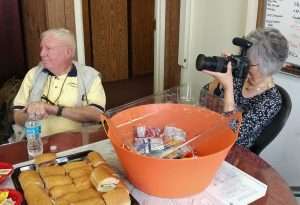 Most of the attendees were veterans, many of them men who fought in World War II and Korea. 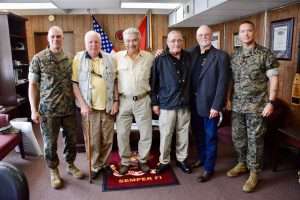 There were also a good number of Vietnam War veterans as well as men and women who fought in the wars of the Middle East. 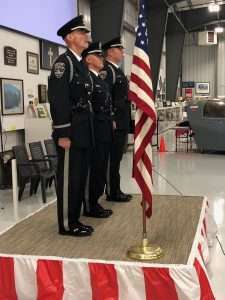 We even had active duty United States Air Force officers, a front seater (pilot) and a back seater (weapons officer), who fly F-15E Strike Eagles out of Mountain Home Air Force Base in Mountain Home, Idaho. 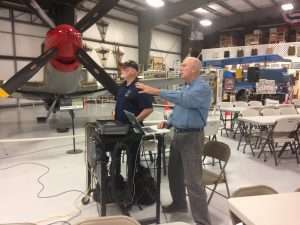 Guest speaker Ken Rodgers and Barry Hill of the Warhawk Air Museum discussing the display screen prior to the event. Photo courtesy of Betty Rodgers. 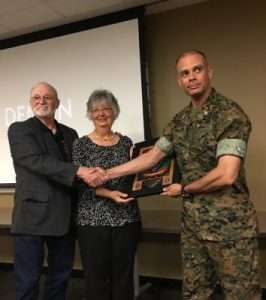 The Warhawk also records video interviews of veterans talking about their combat experiences, sponsors field trips for school children and has educational classes so students in the area’s schools can learn about the military and wars directly from veterans, the folks who know the emotional aspects of combat. Visitors who travel through Idaho go to see the museum as they pass through, and for some, a trip to the Warhawk is a destination in itself. Thanks to Sue Paul and Barry Hill and the staff and volunteers at the museum for their support on my presentation as well as all they do for veterans and the memory of those who have served our country. If you are interested in finding out more about the Warhawk you can find their webpage at http://warhawkairmuseum.org/. Several weeks back I blogged about June 1, 1967. Today I want to write about June 14, 1967 at Khe Sanh. 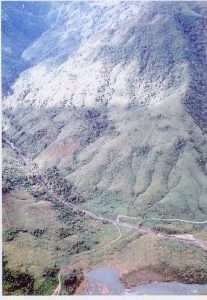 On today’s date in 1967 Bravo Company was dug in on Hill 881 South and still staggering from the events of June 7 when a patrol ran into an NVA ambush and we lost 19 good men. Besides living with our collective grief and agony, at 16:15 on June 14, 3rd Platoon Bravo received an incoming sniper round and responded by calling in an 81 MM mortar mission that evidently silenced the sniper. Whether the sniper was actually nullified or if he moved to another location was not known. Elsewhere in 1/26’s area of responsibility in the Khe Sanh region, Charlie Company discovered an enemy bunker and destroyed it with five pounds of C-4. A look at Route 9 outside Khe Sanh. Notice the rough terrain. The battalion’s command chronologies for 6/14 made the area sound relatively quiet for a war zone. It was about this time that Bravo went out on patrol to Hill 881 North and beyond, and in the process of digging around in the old battle sites of the Hill Fights which happened in March and April of 1967, found the scattered remains of human bodies partially sticking out of the mud where a fresh torrent of rainwater had eroded what looked like a burial site. Someone spotted a ragged uniform remnant and that led to someone else digging around in the red-mud mess and then a femur appeared out of the muck with swatches of what we assumed was an NVA uniform still attached. The bone was yanked out of the ground and the femur soon hung off the jungle dungaree trousers of some Marine whose name I cannot recall. In my memory, I cannot see the Marine’s face but I can see that leg bone dangling off the left side of his dirty dungarees. I don’t think that lasted long. I suspect the platoon sergeant or some officer spotted the bone on the belt and delivered an order that the bone was to be disposed of. You hear stories over the course of your life about a Marine who cut off and collected the ears of his enemy or Marines who pulled the gold teeth out of the mouths of enemy corpses. I never saw any of that, but I did see the bone dangling off the leg. I usually have a good memory for names and faces of the men I served with in Vietnam, but during this time frame, subsequent to the ambush of 6/7, the faces that haunt my memory are like a maze of eyes and mouths and skin colors. We were an ethnically diverse group, I believe, because that’s how it was back in the 60s before the draft was killed. What became 2nd Platoon of Bravo 1/26 was a mix of men from both 2nd and 1st Platoons, which had taken the bulk of casualties from the event of 6/7/67. We had, for a short time, a new platoon commander, Ben Long, who went on to command 1st Platoon and then became Bravo Company’s XO during the Siege in early 1968. 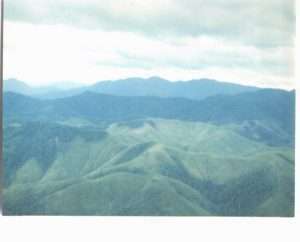 A look at the mountains around Khe Sanh. I often think how difficult it must have been to run an efficient platoon filled with a number of men who had no familiarity with each other. 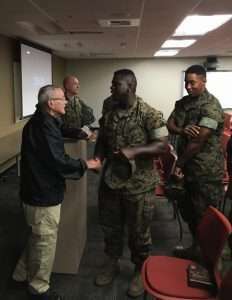 I know the Marine Corps prides itself on the ability of the NCOs to run the ship, but when you don’t know the man who’s got your back, it’s hard to trust him and if you don’t trust him, he knows it and if he knows it, he won’t trust you as much as he might need. Fortunately we had a strong set of NCOs: Staff Sergeant Ward and Sergeant Blankenship and Sergeant Martinez, Corporal Dede, Corporal Poorman, Corporal Fideli and others whose names I can’t remember. The Marines of 2nd Platoon were a dirty, ragged bunch, but Lieutenant Long and the NCOs held us together. We became a unit of Marines. We learned to trust each other and to work with each other despite a number of obstacles in leadership that kept coming to the fore after Lieutenant Long went to on to command the newly reconstituted 1st Platoon. As the summer wore on, we moved from Hill 881 South to the combat base and then some of us went out on Route 9 for over a week after 1st Platoon busted up an NVA ambush intended to fry bigger fish, traffic of heavy guns going up to Khe Sanh. Then we moved on to Hill 861 and then back to the combat base and rivers of rain. It was a summer of long patrols and nights spent out in the mist and rain waiting for an enemy that would not show up. Occasionally we took sniper rounds or someone got a glimpse of the enemy, but there was little action and when there is not action, Marines turn to work to keep themselves out of trouble. So we dug and dug and filled sandbags and installed culverts made from 55 gallon drums with both ends cut out so the trenches would drain and we wouldn’t have to stand knee deep in the water that accumulated from the incessant precipitation. We were damp and dirty and often soaked. But we persevered. If you or your organization would like to host a screening of BRAVO! in your town please contact us immediately.